GUATEMALA CITY (CNS) — Guatemala’s highest court annulled the conviction of a former dictator found guilty of genocide and crimes against humanity. 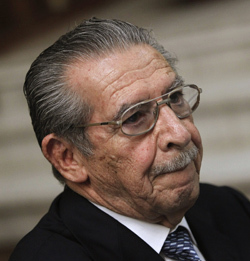 The constitutional court threw out the May 10 ruling against Gen. Efrain Rios Montt, 86, who had been sentenced to 80 years in prison for crimes carried out in 1982, when he allegedly initiated a policy of extermination of Mayans for their ties to Marxist guerrillas. The ruling was seen as historic in a country known for its impunity. Former Guatemalan dictator Efrain Rios Montt attends his genocide trial at the Supreme Court of Justice in Guatemala City May 9. The five-judge constitutional court panel ruled May 20 that the trial should have been halted April 19 during a series of challenges by lawyer Francisco Garcia, who was expelled earlier for trying to have judges dismissed for bias. In a 3-2 ruling, the constitutional court said anything presented in the trial before April 19 could stand, but anything introduced or argued after that date would need to be presented again. Guatemala’s 36 years civil war left an estimated 200,000 dead and 45,000 missing when it ended in 1996. It should be noted that Montt was a very anti-Catholic dictator.